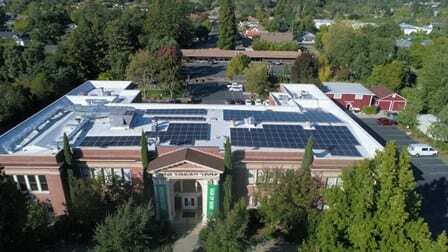 Novato- and Sonoma-based SolarCraft announced that it has completed the design and installation of a 23 kW solar electric installation for the Hartle Court Permanent Supportive Housing project in Napa, CA. The recently completed housing complex is now powered by clean solar energy, providing significant savings to the facility. The Supportive Housing project, developed by the Gasser Foundation and operated by The Progress Foundation, is targeting LEED (Leadership in Energy and Environmental Design) Silver. This would be the Napa Valley’s first LEED Certified Multi-Family Residential Development. The project consists of 98 Sharp 235-watt solar panels spanning 1,719 square feet of rooftops on multiple buildings. The system is expected to generate approximately 31,540 kilowatt hours of energy annually, providing sustainable and price stable energy to the complex for years to come. The new solar energy system allows the Housing Project to generate enough electricity each day to power over 11 average homes. It will spare the air nearly 17 tons of harmful greenhouse gases annually. Over the next 30 years, the air pollution saved will be equivalent to eliminating over 1 million miles of driving. The monitoring display for the system is located in the front office and is available for public viewing. The new complex, on Hartle Court West, includes 18 one-bedroom apartments and six two-bedroom apartments. The two-bedroom apartments will serve “transitional age youth,” typically young adults leaving foster care homes. The one-bedroom apartments will be for adults served by Progress Foundation, a non-profit agency dedicated to providing community-based residential treatment and supported housing programs to people with mental disabilities.